Reviews of "Freckles Lends a Paw"
Freckles and her friends have always been scared of that one house. The house where a mean, old rabbit, Mr. Loppity lives. Children have always avoided him but one day, Freckles learns that everyone must over-come their fears and sometimes they can't be avoided. She learns that sometimes the thing that you fear most, isn't so scary after all. Freckles and her friends soon begin helping him and also learn that appearances can be deceiving. Join Freckles and her friends in another funny adventure, this time with their siblings. 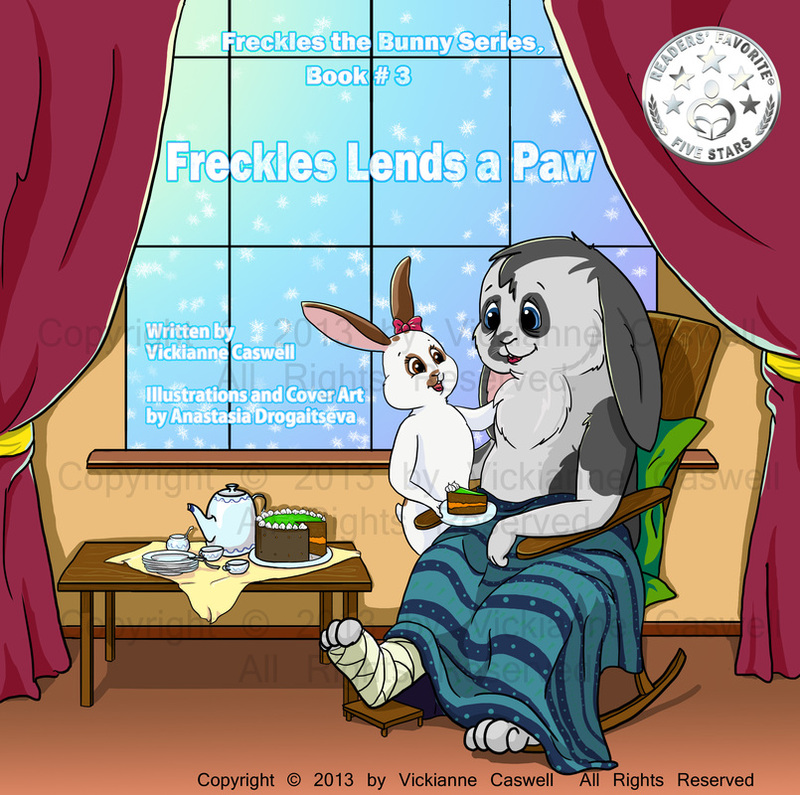 Freckles the Bunny Series, Book # 3: Freckles Lends a Paw is written by Vickianne Caswell. This book is created as part of a series for children. The story offers a mix of emotions from its characters: happy, sad, scared, excited, and hopeful. Freckles the bunny lives by a neighbor, thought to be a mean old bunny who doesn't like children. Some of the neighborhood children and friends of Freckles even call her neighbor a wizard that will eat children. Mr. Loppity, Freckles's neighbor doesn't like children because the neighborhood children didn't respect his property and did bad things to it. Freckles didn't notice Mr. Loppity outside and told her mother. When she came home from school and found out what happened to her mother and Mr. Loppity, her feelings towards him changed forever. Freckles also discovers a new feeling she had never felt before; one that made her feel warm and fuzzy inside after she and her friends do something for Mr. Loppity. Vickianne Caswell has created a children's book series that is educational and family oriented. The book offers amazing, colorful pictures to go along with a fun life lesson intertwined into the story line. Freckles the Bunny teaches children the importance of not judging someone without getting to know them first, and that doing good deeds and helping a person out of kindness can make you feel good inside. This book is a wonderful story to be shared with adults and children alike. The illustrations are beautiful. The animal characters were "a hit" with the students. We appreciated the "live animals" as well. Thank you. The story teaches children about how to have compassion for others. A great story to teach children about not being judgmental of others. This story also teaches "community." Thank you for sharing your characters and story with us. We appreciate it! - Heather McNairn, Saskatoon teacher. Book was great and age appropriate! Thank you! 1. The book shares a clear message about not judging people and lending a hand to those in need. 2. The book shows children a great example of being a valuable member of the community. 3. I enjoyed the humor included in the serious message in the story. 4. Great illustrations to accompany the story. - Sandra, Saskatoon kindergarten teacher. In Freckles Lends a Paw we meet both old and new characters who come together to help teach Freckles and children everywhere yet again another valuable lesson. This time we learn the value of friendship and trusting in oneself and others instead of allowing fear to rule our lives. Fear of the unknown, fear of rumors, and fear of bad behaviors, all are easily overcome when you work together. We meet poor old grumpy Mr Loppity who is accused of not liking children very much and of being a mean old wizard. The children pick on him and throw things at his house making him even grumpier (understandably). When Freckle’s mum finds him injured and comes to his rescue the children quickly learn Mr Loppity is perhaps not so frightening after all. Fun antics in the house ensue as the friends soon learn that to help others is far more rewarding than at first it may appear. The book is fun and with a good message. The text could use some literary editing but it is good. There are gorgeous illustrations that set this book apart in the kid book library. We are all mesmerized my colors and figures. It's a great gift for any kid in your life. In fact, I bought one for my husband because he likes the artist.